This February, the unPOPable GAZILLION BUBBLE SHOW, begins its incrediBUBBLE 13th year in New York City. New York’s MUST SEE bubble extravaganza, GAZILLION BUBBLE SHOW has had 4,659 performances in the Big Apple and has been seen by over 779,000 people at New World Stages (340 West 50 Street). In 2007, performer Fan Yang brought his unique brand of bubble artistry to New York City and has since wowed bubble lovers of all ages. Its original New York production was only intended to be a nine-performance limited engagement, but audiences were immediately delighted with the unbubblievable experience and the demand for tickets grew. 12 years later, GAZILLION BUBBLE SHOW continues to amaze with mind-blowing bubble magic, spectacular laser lighting effects, and momentary soapy masterpieces that make you smile, laugh, and feel like a kid again. 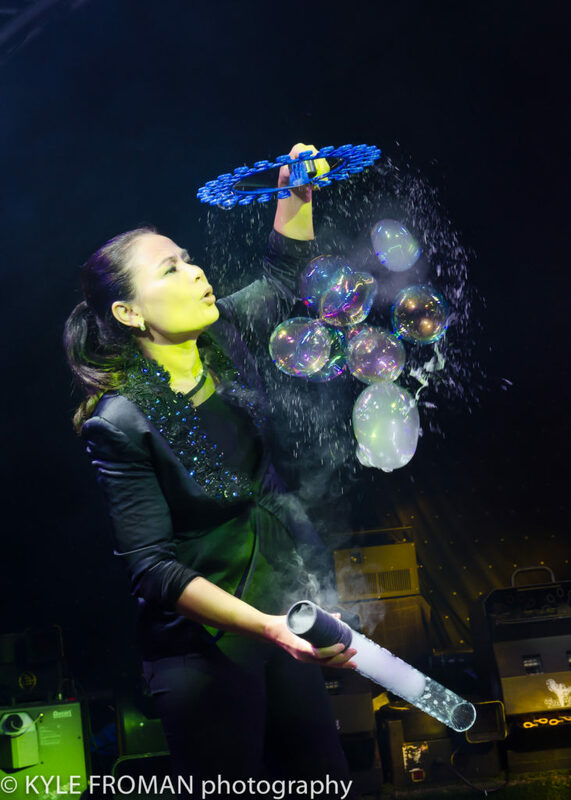 GAZILLION BUBBLE SHOW has made its mark in the US with resounding audience and critical acclaim having been called “enchanting” (NY Times) with“ingenious bubble wizardry” (The New Yorker). It’s “a dazzling succession of bubbles in mind-blowing configurations” (Time Out NY) that “…earns its claim on the word spectacular” (NYTheatre.com). “An unforgettable extravaganza!” (City Guide). GAZILLION BUBBLE SHOW’s appeal extends well beyond the stage, having been featured on more national television shows than any other show On or Off Broadway, including appearances on “The Oprah Winfrey Show,” “The David Letterman Show,” “Live with Regis and Kelly,” “The Ellen DeGeneres Show,” “The Today Show,” “Good Morning America,” “The Steve Harvey Show,” “The Queen Latifah Show,” “Harry,” “The View,” “CBS Sunday Morning,” “The Wendy Williams Show,” “Bethenny,” “Dr. Oz Show,” CMT’s “Pickler and Ben,” “The Bonnie Hunt Show,” “Fox & Friends,” CNBC, FOX, NBC, ABC, CW11, NY1 as well as television stations around the world. GAZILLION BUBBLE SHOW has also bubblized scores of A-list Hollywood celebs and their families including Ashton Kutcher, Tom Cruise, Al Pacino, Halle Berry, Julia Roberts, Chris Rock, Debra Messing, Matt Damon, Faith Hill, Emma Stone, Andrew Garfield, Alyssa Milano, Heidi Klum, Seal, Peter Dinklage, Rosie O’Donell, Al Roker, Perez Hilton, Adam Sandler, Bethenny Frankel, Swizz Beats, Liam Neeson, Patrick Wilson, Bruce Willis, Chris Rock, Nicole Kidman, David Beckham, Simon Fuller, Emily Blunt and John Krasinski, Chelsea Clinton and many, many more. This show is fun for the whole family and appropriate for ages 1 to 100!